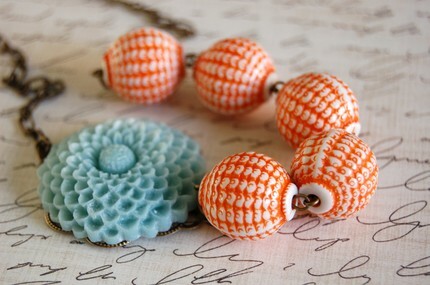 Pale blue marigold medallion contrasts with its brilliant orange and white lantern beads. The meticulous details of this necklace add to its vintage charm, all in a modern asymetrical design. These colors are Hot for fall. Made by Brittany Chavers, found on Etsy.com.